BELLE LAKE: 3 Reed Warblers, including 2 singing males. BROWNSTOWN HEAD: 2 Great Northern Divers flew W over the head (1 later seen on sea), 2700+ Manx Shearwaters feeding offshore along with 15+ dolphins (unidentified). HELVICK HEAD: 1 unstreaked Acrocephalus warbler (Reed or Marsh Warbler, possibly showing some characters of latter). 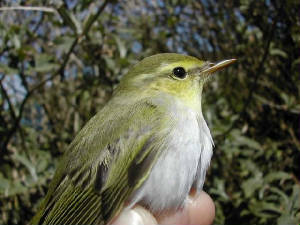 BROWNSTOWN HEAD: 1 Wood Warbler (mist-netted and ringed), surprisingly the first authenticated record for Co Waterford. DUNGARVAN: 2 Brent Geese, 29 Whimbrel. CLONEA STRAND: 1 1st-winter Mediterranean Gull. KILMINNIN, DUNGARVAN: 16 Brent Geese. CLONEA STRAND: 82 Brent Geese, 75 Whimbrel. BROWNSTOWN HEAD: 1 Swift, and a small 'fall' of night-migrants - 1 Wheatear, 4 Sedge Warblers, 2 Blackcaps, 3 Whitethroats, 3 Chiffchaffs, 14 Willow Warblers, 3 Spotted Flycatchers. BROWNSTOWN HEAD: 1 Sedge Warbler. DUNGARVAN: 1 adult Bonaparte's Gull* off the Park Hotel, Ballyneety - the first county record. BROWNSTOWN HEAD: 1 female Brambling, 1 singing Grasshopper Warbler. BROWNSTOWN HEAD: 1 Blackcap, 16 Willow Warblers, 1 Tree Sparrow. 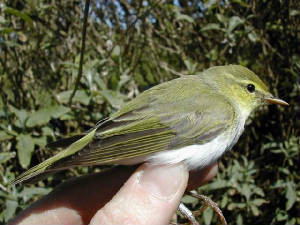 R. BRICKEY, DUNGARVAN: 1 Willow Warbler singing. BROWNSTOWN HEAD: 4 Wheatears, 1 Chiffchaff. KILMINNIN, DUNGARVAN: 1 Common Sandpiper. BALLVOONEY COVE: 2 Surf Scoters*. CLONEA STRAND: 24 Great Northern Divers, 1 Sandwich Tern. DUNGARVAN: 2 1st-winter Ring-billed Gulls. KILMEADEN POOLS: 1 Water Pipit* still present (since 1st December 2003). BALLYVOONEY COVE: 2 Surf Scoters* (adult male + female). 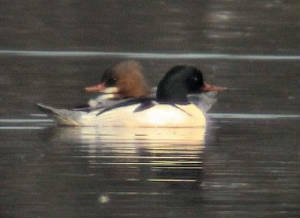 DUNGARVAN: Male Goosander, adult Mediterranean Gull. BALLYVOONEY COVE: 2 Surf Scoters*. TRAMORE BOATING LAKE: 1 adult Mediterranean Gull. BALLVOONEY COVE: 1 Surf Scoter*. nr TRAMORE BACKSTRAND: 2 Buzzards. BALLVOONEY COVE: 1 Surf Scoter* (one of 2 birds since December 2003).